So I'm naturally blonde right, but have been dying my hair dark since year 13, so for about 3 years. I like having dark hair, but recently have kinda had an urge to go back to blonde again! Defs not the shade I was though, which was borderline ginge. Though I really really want long dark hair one day, I'm thinking that maybe in the interim while it grows longer I could be blonde coz it's super easy to go back to dark again from blonde. Plus, it'll be so much easier to maintain when it's blonde, as my regrowth will be blonde so won't have to dye as often! I know the mothership will like this idea, as pretty much every time I see her she tells me how she misses my blonde hair (plus I'm sure she won't mind not having to dye my hair every time she sees me either hah). One thing that is holding me back atm (other than the monetary factor) is that to go back to blonde I'll have to bleach my hair first, and bleach is sooooooo bad for your hair. But since I'll be dying it less when it's blonde maybe it will be healthier in the long run so will be worth it? It will be a big change and is quite a risk I guess but I'm a pretty chilled person when it comes to these kinda things and keen to try new things and I reckon change is good! 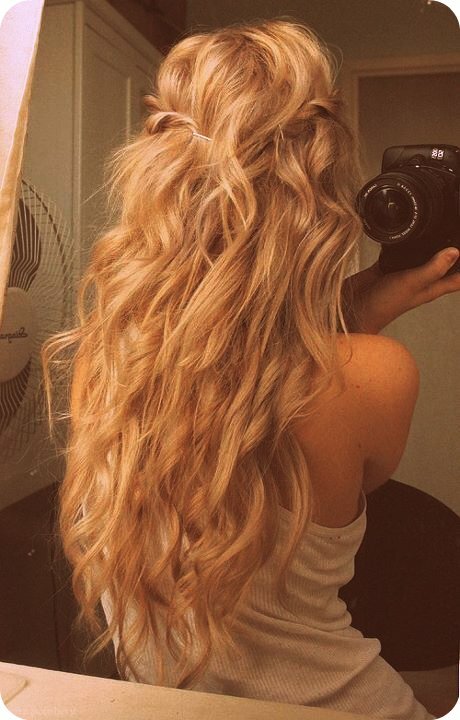 Kinda keen to get my hair done this summer! A prezzie to myself for finishing my degree! Plus, if I don't like it, I can always easily go back to dark hair. But I'm still kinda iffy atm, coz I don't think I'll suit blonde again!!! Who cares about the bleach oi one or two times shouldn't do too much damage if its done correctly! (: that blonde colour in the pic is nice! Ok, but do you reckon I could pull it off? No, unfortunately she wouldn't coz she's just learning the basic root dying this year and I'd have to get it bleached etc etc. Bet it will cost heaps!! Yes I love her curls and how long her hair is! !